If you took damage by battle or an opponent’s card effect this turn: Add 1 Level 4 or lower Cyberse monster from your Deck to your hand. You can only activate 1 “Cyberse Beacon” per turn. The final Special Edition promo this week is an interesting one in my opinion, Cyberse Beacon. If you take damage this turn by battle or by an opponent’s card effect (no self burn), you can search for a Level 4 Cyberse monster out of your deck. You can only use one Cyberse Beacon per turn. Being a trap makes it slow already, but I guess they don’t want any more Reinforcements of the Army type cards. The damage part hurts this card some more, cause you can’t get the search whenever you wish. The card is still a solid search card, but there are too many things slowing it down from making it a great search card. Makes me wonder what big intentions they really have for the Cyberse type as a whole to where they made their search trap this slow. Still an ok card, but it is pretty slow, but I think we are getting a better search card for this type very soon in the next Structure Deck. Closing the week, we have a Deck specific Trap, in Cyberse Beacon. If you take Damage this turn, from Battle or an opponent’s Card Effect, you can add one Level 4 or lower Cyberse Monster from your Deck to your Hand. Said card can only be activated once per turn. This is a simple card, but useful. Access to any Monster (even just Level 4 or lower) of the Deck you’re playing is worth a little Damage, and one Trap, in my opinion. It’s an honest, balanced, 1-for-1, and support should work like this. Plus, it shouldn’t be too hard for the player to plus off this on their next turn anyway. 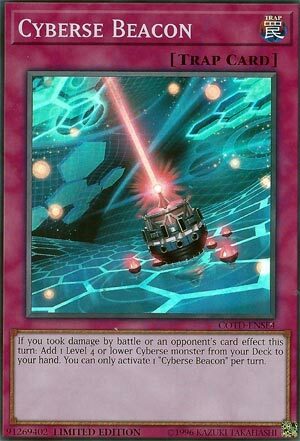 Cyberse Beacon is a Normal Trap that gives you a Level 4 or lower Cyberse monster from the deck to your hand after you take any damage from the opponent. I think Normal Traps are too slow, and it’s not chainable. If you haven’t taken any damage it will just sit there acting like bait. However, Cyberse will get support for years while the new season is around, so this card can only get better. For now, there are better decks and better search options.